Some believe that the “Mill Palm” preceded Bagua Zhang. And that GM Dong learned this in Jiu Hua Mountain onto to incorporated this practice into BGZ. This form of gathering information and restructuring it came early into the Bagua training method producing the many styles that exist today. This one, soft body, These teachers instruction came form Wang Yong Chang. There are a number of interesting sections. There is an entire section on geometric shapes that can be used for footwork patterns. Basics kicks, foot work and hand positions are also shown. In addition there is a long sequence of steps and changes with an emphasis on soft body movement. A good addition to a Bagua library. Shi Ji Dong was the son in law of Dong Hai Chuan who taught him, as he indeed taught all his students, a customized format with special emphasis on the legs. This traditional practice from Li has passed down to Shi Nai Jian and Wang Cheng Shan. This book contains two rarely seen Bagua Fists: the Linked Leg set and the Guiding Fist. The Guiding Fist is composed of 64 movements. The Linked Legs, divided into eight sections, is composed of 118 movements not all of them kicks. A few styles, mostly derived from the Yin Fu branch, have Bagua leg sets. This is one of the longest. The book ends with a one page lineage chart. This little book shows Yin Fu’s branch of Bagua practice with good photos and simple layout. The forms shown are the Old Eight Palm Forms explained. Next comes a Yin Fu set of “serial” palms. All this is followed by Yin style applications many of which are well-known traditional techniques with a few interesting variations. What we get from this book is the loose and open version of Yin style as many people practice it today. The author has a nice overall relaxed and comfortable form. Do not be fooled by the picture on the cover, this is a single-headed spear set from the Cheng Branch of Bagua. Ms. Li, a martial arts competitive champion, is a student of the famous Sun Zhi Jun. This is a longish set with the complexity of a well-developed art. Ms. Li is a hand- picked student to represent the style and appears on a number of Sun instructional DVDs. Definitely one of the better Bagua spear sets especially for its clarity and integration of correct Bagua technique. We also carry a DVD of this form. Clear and simple illustrations and lots of them. Probably one of the shortest Elk Horn Knife sets on record. After presenting a variation of the Eight Palm Changes by Jiang Rong Jiao, Mr. Zhao illustrates breakdowns of the "hidden legs" of BaGua (and they are indeed hidden when you first learn the art, at least to most people) . 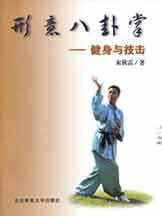 In this book, compared to A805 below, the explanations are all usage from the particular form, where, in the Fatal Kicks book, general BaGua kicks are demonstrated. 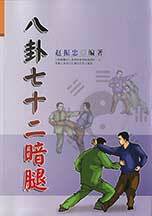 Clear illustrations (and of a decent size) highlight this book strictly on the applicatons of kicking in Bagua. Easy to understand and all you need is a partner to take the beating. There's a short introduction about the general movements of the style and then one and two-step illustrations of leg usage. This book is on the combined styles of Xing Yi and Bagua but with aa distinct leaning toward reintrepreting Bagua with Xing Yi flavor added. It shows a lot of training methods some of them simple such as basic iron palm slapping and some more interesting such as a series of different execises with the Bagua poles. Next comes a formal section with the animals changes emphasized based on Bagua's eight animals and a somewhat Xing Yi inspired intrepretation of them. Finally a lot of rather free drawings of Bagua applications many inspired by the classic book and others, including multiple attackers, by a more imaginative muse. 230 Pages, Softbound. Photographs and illustrations. Bagua Zhang Shu Ji Cheng. A compendium, the name suggests, of the Liang Branch of Bagua practice. Direct lineage teachers show the basic circling palms of this system along with applications and a "64 move" application set somewhat like the linear style of Gao Branch. One of the few books on the very respectable Liang Zhen Pu branch of the art. This book covers a lot of Bagua including principles, form, body arts relating to all parts, five form palm, strategy, the "36 Song", 48 hands methods, health issues, usge, applications and more. A clear and useful manual on the entire Bagua system. Guo Gu Min (1887 - 1968) was a major proponent of Bagua. Early on he started to learn and communicate with many Bagua masters and had access to a wealth of information on martial arts. He was taught by such varied master as Yi Fu, Kiu Feng Chun, Li Cun Yi. At this time separate styles were no barrier since Bagua still reflected its common origin with Dong Hai Chuan. 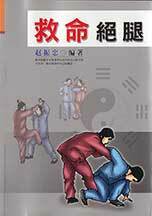 Guo wrote on Bagua even revealing some special techniques from Dong Hai Chuan never written before. He taught many hundreds of people and was instrumental in Bagua's development especially in the BeiJing area. Among his contributions were the 64 Hands Straight Line practice and the Bagua Hook Swords. "San Shou"- free hand - can have a number of meanings in different martial contexts. In this case one might think of it as a "linking set" as in Xing Yi. The core form to this book is a series of movements which are not structured around the circle. BaGua San Shou also refers to spontaneous practice of turning and changing. In addition a number of BaGua Chi Kung type exercises. 186 pages, Soft bound, Photographs. ShihFu Zhang has impressed us with his excellent presentation of LIANG style BaGua. His VCDs and DVDs are some of our most popular. Here he presents stretching, postural and Chi Kung exercises based on the system of BaGua in which he is expert. The photos are a little on the fuzzy side but they are easily understandable and the movements are demonstrated with integrity and clarity. A good beginning volume on Cheng style BaGua Zhang. Li starts it with a section on his own introduction to martial practice. This is followed by a chapter on BaGua health building. Then BaGua's flavor in self defense. Other sections include: mud stepping, basic hand positions, 8 Big Palms, Swimming Body linked palms, exercise palms and practice palms. Many photographs. 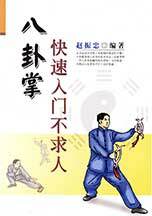 A huge manual containing good photos and a lot of information on the art of BaGua. Includes 8 Mother Palms, Usage, BaGua Saber,BaGua Chi Kung, BaGua Posture training, mixed routines and much text on the art. An outstanding compendium of information on BaGua with a lot of information. Photographs clearly illuminate this book about the BaGua straight sword known as "Three Harmonies". The entire set is shown and, in addition, a partner set with the sword similar to the famous San Tsai sword but with a BaGua emphasis. A nicely done edition of Yin Yang BaGua Zhang. This volume focuses on the branch which is known as Lion Form Palm: that is the 8 changes inspired by the Lion's energy. Good photos, a young and limber practitioner and form pictures interspersed with applications. 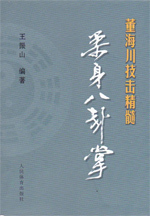 Another BaGua book by the indefatigable Liu Jing Fu. This time he focuses on his beloved style, Cheng Shi. Bagua Zhang. One bonus is that just about everything in this book is demonstrated by the clear form of Liu himself. Applications are given as the text and photos show the Palm Changes. This text has explanatory notes on footwork, palm work, etc. Then it delves into the 8 X 8 64 Palm which it shows with applications and variations. Next comes the 8 X 8 64 Hand form which is a Linked Hand set shown without applications. The book also has some color plates in the front. 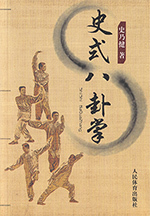 An amazing four-volume set on the art of Bagua. Weapons, exercises, applications, forms... etc. Born in 1933 Zhu Bao Zhen studied from three BaGua masters: He Zhong Xing, He Zhong Chi and Liu Zhen Lin. He is the martial brother of Liu Hung Chieh, one of B.K. Frantzis' teachers. He was born in July, 1933. After studying Shaolin and Xing Yi he was introduced to BaGua with Liu Zhen Lin. He is particularly expert in Yin Branch of the art. His accomplishment in this art is considerable. His movements are fluid and changeable showing the prinicples of BaGua in every action. Still strong for his age he shows a lively and precise interpretation of the style. At present we can only offer a few copies of Volumes #2 and #3. Be assured, if we see the other volumes, we will get them! Great teachers such as Yin Fu and Cheng Ting Hua. Basic hand positions and kicks. Walking and different foot patterns. Basics of the BaGua Saber. 8 Big Old Spear Moves. Advanced Two Headed Spear form. Advanced Elk Horn Knife form. 赵振忠 Zhao Zhen Zhong, born in 1947, a university graduate. Since childhood he loved Wushu, and acknowledged as his teacher the famous Wushu instructor Han Mu Jia's sworn brother, Mr. Han Jin Shan, from whom he studied Shaolin Quan & TaiZu Quan, In 1965 he moved to YunNan to work as YunNan WuShu drill instructor for the Saudi Arabian government. He continued his studies with BaGua Zhang, Tong Bei Quan, etc. At the same time he succeeded in learning from teachers such as Jiang Rong Qiao, Wang Zi Ping and receiving personal instruction from other important Wushu seniors, allowing him to attain the essence of Wushu. For many decades he has relentlessly practiced martial arts, never slacking, many times visiting the Chinese mainland and winning prices there, also visiting Britan lecture on the arts. Throughout the decades he had written and published many articles and essays, such as (The Theory of BaGua Walking) delivered at the International BaGua Symposium and other excellent dissertations, he has published (BaGua 72 Hidden Kicks) (Miraculous Cavity Strikes) (Fatal Kicks) ( Rapid Introduction to BaGua for Self Instruction) and numerous other writings, much to the praise of students and professionals in the arts. 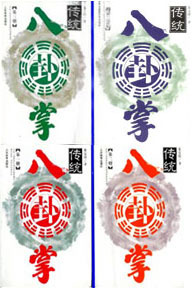 He 2003 he was awarded a Seventh Duan in the art of WuShu.